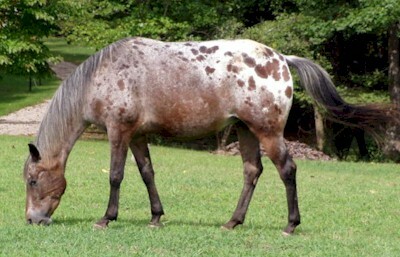 Appaloosa horses are known for their colorful leopard-spotted coat pattern. They have a wide range of body types, stemming from the influence of multiple breeds of horses throughout its history. Each horse's color pattern is genetically the result of various spotting patterns overlaid on top of one of several recognized base coat colors. The Nez Perce people of modern day Oregon and Washington, US, developed the Appaloosa breed. Appaloosas were once referred to by settlers as the "Palouse horse", possibly after the Palouse River, which ran through the heart of Nez Perce country. Gradually, the name evolved into "Appaloosa".